In the penultimate episode of NXT before Takeover: Brooklyn II, a number of the building blocks for the 20th August show would fall into place. With the NXT Champion in action in the main event, how would the yellow brand look to build momentum? The main event bout between Samoa Joe and Mojo Rawley was a much stronger affair than I was expecting it to be, with Rawley upping his aggresiveness to match Joe, with a crowd that sided strongly behind Rawley. Despite the new Smackdown performer being slightly off with the timing of some of his offence, the pair were able to put together some nice sequences, highlighted by Rawley's massive leap into an STJoe. The NXT Champion picked up a convincing victory with the Coquina Clutch, however shouting out his 20th August opponent as he locked in the move produced the most interesting part of the show. 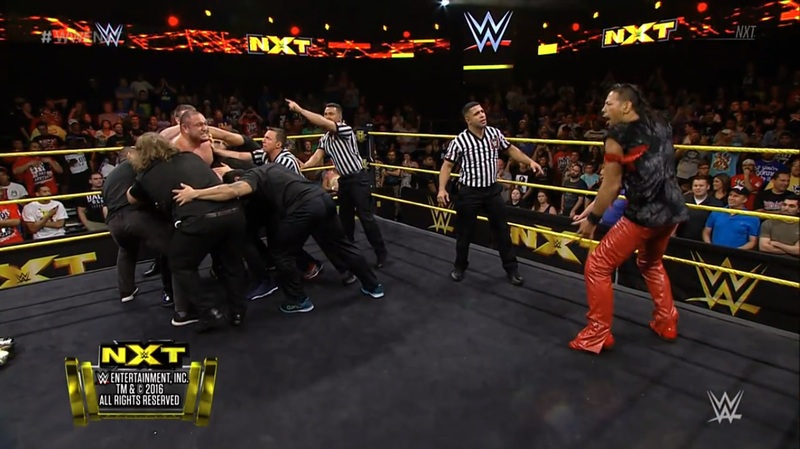 A very different version of the pull-apart, as Joe was held back by security and officials whilst #1 Contender Shinsuke Nakamura continually wound him up by grabbing his nose. Very entertaining stuff that adds to the build of the upcoming title match. Another match would be added to the 20th August supercard, after Andrade Almas had bested NXT stalwart Angelo Dawkins in a couple of minutes. The match was a short squash, although Dawkins did manage a sweet spinning version of the Stinger Splash, with Almas pulling out a complicated hammer lock DDT/leg sweep situation for the victory. 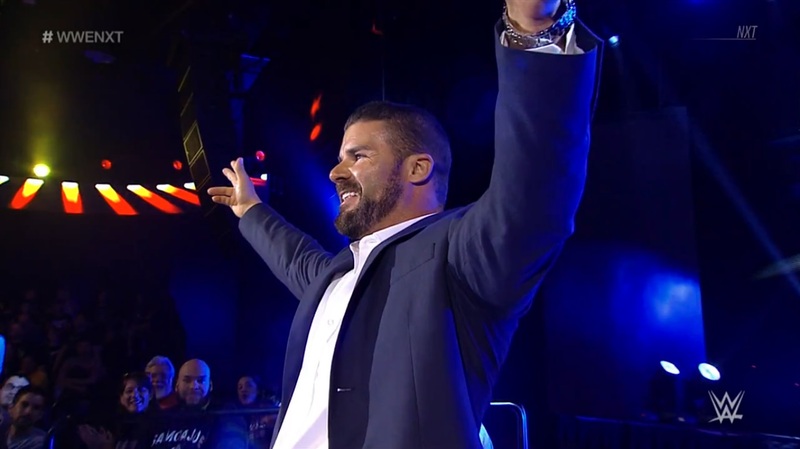 It was the confrontation afterward with newcomer Bobby Roode that would produce the intrigue though, as Roode did a brilliant job working the crowd in order to get them on the side of his opponent. Almas is still struggling to get over with the Winter Park crowd, but Roode speaking slowly to him, as he attempted to explain that they'd be having a match at Takeover: Brooklyn II seemed to go, at least, some way towards that. The upcoming match between the two should solidify both men's places on the NXT roster. A contract signing segment between Women's Champion Asuka and #1 Contender Bayley, hosted by General Manager William Regal was an engaging piece of television as the two rivals attempted to build the tension between them, ahead of their 20th August title bout. The majority of the strain was developed in their body language in the latter portion of the segment, as their initial back and forth on the microphone was let down by Asuka's broken English. It appeared like the Women's Champion got a couple of words in the wrong order or choose the wrong words at points, as I'm not entirely sure what she was attempting to say, luckily it didn't effect things too much as the confrontation that followed was strong enough to cover it up. It is notable however, that the Full Sail Arena seems to be cooling Bayley, perhaps because of the length of her time on the show, when she really should've been called up a few months ago. It was however clear to see why Bayley had been kept on the yellow brand, as Billie Kay and Liv Morgan's contest was not the greatest showcase for either woman. Honestly, the thing I enjoyed most about the entire contest was the entrances, which had some cool juxtaposition going on. The match itself did very little for though, mainly down to Morgan who seemed to be a step off at most points, with sloppy offence and delayed selling. At 22 years old, there's still time for her to improve, but after two years in the Performance Center, I'd at least be expecting her to handle a three minute squash. I haven't seen enough of Kay to be convinced by her yet, I'm hoping that we get to see her have longer matches against the likes of Asuka, Ember Moon, Bayley and Peyton Royce sooner rather than later to see what she truly has to offer. The #1 Contender's to The Revival's Tag Team Championship's got a run out this week also, picking up a swift victory over Tucker Knight and Patrick Clark. As squash tag team bouts go, I found this to be a fun watch with Knight and Clark doing their jobs well, making Ciampa and Gargano look great, whilst also heeling it up nicely to allow the #1 Contender's to make a spirited and exciting comeback. Gargano and Ciampa continue to improve as a team and after only teaming up a year have become one of the smoothest duos around at the moment, with their slick comeback routine and finish on Knight showing just a taste of what they're going to do with Scott Dawson and Dash Wilder on 20th August. The Authors of Pain (Gzim Selmani & Sunny Dhisa) continued to dominate with a victory over Rob Ryzin & Adrian Nails. Some strong stuff on this week's show, like the Joe v Rawley match and Joe's subsequent confrontation with Nakamura, as well as Asuka and Bayley's contract signing and Roode v Almas being confirmed for Takeover: Brooklyn II, as the brand continues to load it's supercard for 20th August. The rating then looks a little harsh, however as always the ATPW Scale takes into account the entire show and unfortunately the show was let down by the Kay v Morgan match that just wasn't good enough. The Women's division has been decimated over the last year with Becky Lynch, Sasha Banks, Charlotte, Carmella, Alexa Bliss, Nia Jax and even Eva Marie departing and some talents are really going to have to keep upping their game to fill that gap. The likes of Kay, the yet to debut Nicola Glencross, Morgan, Aliyah, Mandy Rose and more have the potential to do so, but only time will tell.